After silver, copper is the best conductor of heat. A copper pan allows you to cook with great precision. You can precisely select a temperature and keep the contents of the pan at that temperature for a long time. New copper pans must be washed thoroughly with boiling water. Dry your new pan with a soft, clean cloth and it will be ready for use. The copper allows an optimal heat conduction, while the aluminium forms the connection between the thermal conductivity of the copper and the strong stainless steel inside. This combination of materials provides the advantages of copper and the benefits of stainless steel. 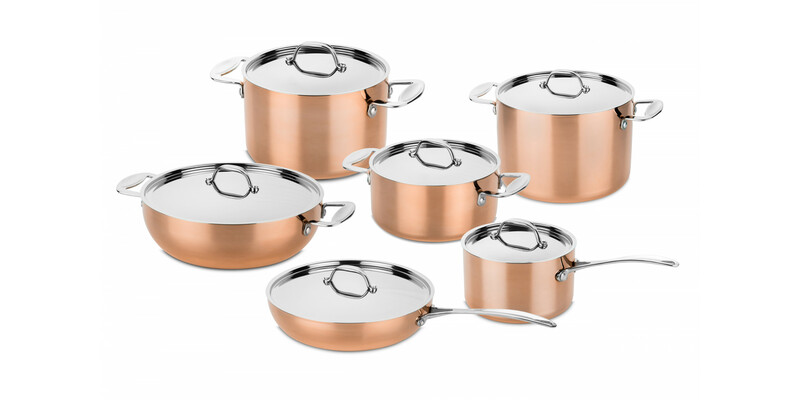 Copper pans retain their beautiful glossy appearance when they are cleaned without chemicals. If there are smudges on the pan, they can be erased with natural acids such as buttermilk or lemon juice and some salt. Mix these in a bowl and rub the mixture over your pan. Wait fifteen minutes and then rinse off with hot water. The appearance is a distinctive feature of this copper pans. Copper is not only stylish, but it adds something extra to your kitchen, from amateur to professional. Many professional chefs prefer cooking with copper pans. These pans are perfect for both modern contemporary and classic country kitchens! Our copper pans are not suitable for induction but they can be used on electric or gas stovetops and in the oven.